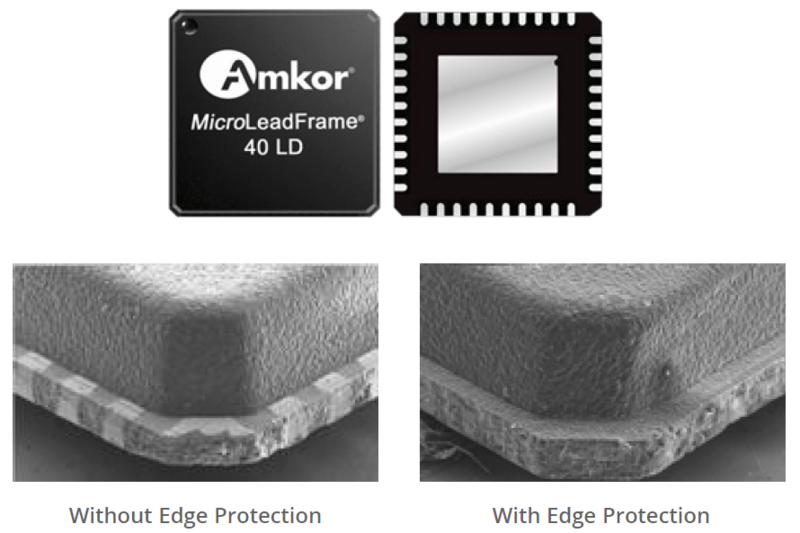 To further improve the robustness of the MLF® package design, Amkor has developed an Edge Protection™ technology that protects the edges of the device during handling operations such as test and surface mount assembly (SMA). Since its inception in the late 1990’s, Amkor’s MicroLeadFrame® package has seen accelerating adoption by the automotive industry due to its size advantages, robust performance qualities, and integration of wettable flanks. Amkor offers its MLF package in punch and saw formats to meet the demanding application needs of the automotive industry and is recognized as the premiere supplier of the QFN package to the automotive industry. As the leader in providing quality QFN packaging solutions to meet the known challenges of the automotive applications, Amkor has continued to develop enhancements to extend the capabilities of the MicroLeadfFrame® packaging solutions. With the proven technology of dimple end leads, the punch MLF continues to be the format of choice for automotive applications. As Amkor’s Edge Protection technology improves the robustness of package design, this innovative enhancement is rapidly growing in acceptance, particularly in the area of test. By strengthening the edges of the punch MLF package, test induced damage has been significantly reduced. Amkor is now offering its punch MLF package with Edge Protection technology in a variety of body sizes. Amkor’s package enhancement protects the edges of MLF® packaging during handling, test and assembly process operations. Contact an Amkor expert by clicking the request info button below.